Titus Flavius Vespasianus, commonly called by his praenomen Titus, was the son of the Emperor Vespasianus and his wife Flavia Domitilla. He commanded a legion in his father's Jewish campaign and captured Jerusalem in A.D 70. On his return to Rome, Vespasianus made him his colleague and succeed him in A.D. 70. 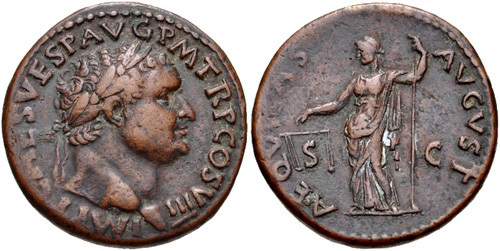 Obverse: IMP T CAES VESP AVG P M TR P COS VIII, laureate head right. Reverse: AEQVITAS AVGVST S C, Aequitas standing holding scales and staff. 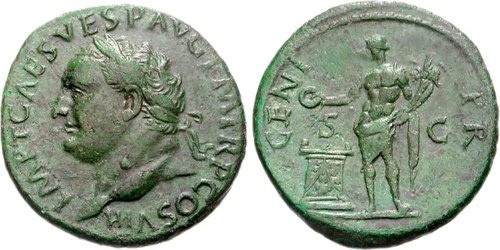 Obverse: IMP T CAES VESP AVG P M TR P COS VIII, laureate head left. Reverse: AETERNIT AVG S C, Aeternitas standing right, foot on globe, holding sceptre and sceptre. Reverse: AETERNIT AVGVST S C, Aeternitas standing right, foot on globe, holding sceptre and sceptre. 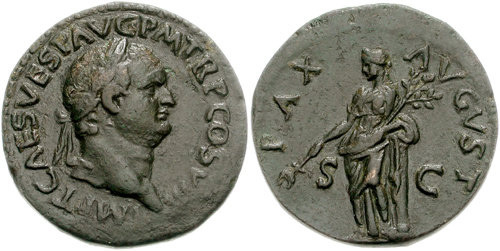 Reverse: GENI P R S C, Genius standing left with cornucopiae, sacrificing from patera over lighted altar. 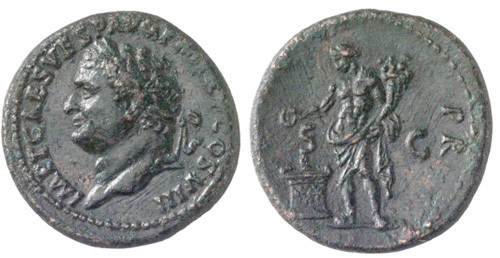 Reverse: GENIO P R S C, Genius standing left with cornucopiae, sacrificing from patera over lighted altar. Reverse: PAX AVGVST S C, Pax standing facing, head left, holding branch and long winged caduceus. Reverse: S C, Spes advancing left, holding flower and raising hem. Reverse: SECVRITAS AVGVST S C, Securitas seated right holding sceptre; lighted and garlanded altar before. Reverse: VICTORIA AVGVST S C, Victory advancing right upon a prow, holding a wreath and palm.